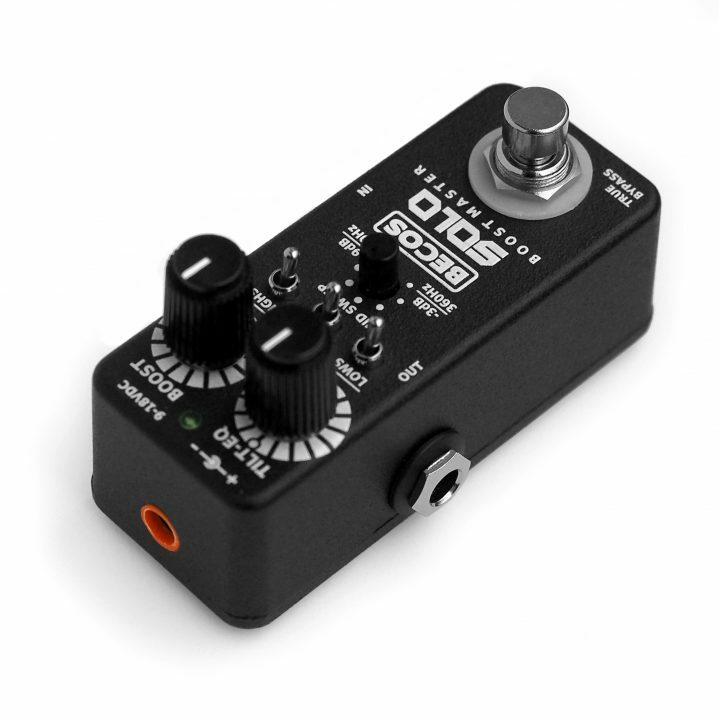 What started as Micro Booster has evolved into a clever preamp pedal. SOLO Boost Master Preamp is a unique designed clean FET buffer/booster pedal with added control for solo tone shaping. Encased in a rugged yet tiny aluminum box, this high quality built circuit has audio mastering virtues. The SOLO Boost Master Preamp is based on a clean FET buffer/booster circuit, with simple to use controls, which, used in combination, reveal their real power of sound shaping. Encased in a rugged aluminum box, this minion takes little space on any pedalboard. A variable gain stage allows a flat raise of the input signal, starting from unity gain (buffer level) and going up to +20dB of amplification, enough to either saturate the following drive stage or boost the signal when placed after. A Tilt-EQ active circuitry borrowed from hi-end music pre-amplifier design may be used to add minor corrections over buffered or boosted signal. Left in the middle position, this control does not alter the sound. On top of that, three additional cut filters can delicately act upon selected frequency spectrum, to further contour audio signal. The mid-cut section has the most powerful effect in conjunction with the variable Mid Sweep control, which selects the cut spectrum as well as the amount of cut. SOLO Boost Master Preamp raises the bar in audio small signal amplification, rendering a pristine and warm sounding guitar tone. It complements well any instrument’s magnetic pickup, but it can also be used to warm-up the powerful and sometimes sterile sounding active pickups.